The Obelisk of Axum (Amharic: የአክሱም ሐውልት) is a 4th-century AD, 24-metre-tall (79-feet) granite stele/obelisk, weighing 160 tonnes, in the city of Axum in Ethiopia. It is ornamented with two false doors at the base and features decorations resembling windows on all sides. The obelisk ends in a semi-circular top part, which used to be enclosed by metal frames. The obelisk—properly termed a "stele" or, in the local Afro-Asiatic languages, hawelt/hawelti (as it is not topped by a pyramid) — is found along with many other stelae in the city of Axum in modern-day Ethiopia. The stelae were probably carved and erected during the 4th century A.D. by subjects of the Kingdom of Aksum, an ancient Ethiopian civilization. Erection of stelae in Axum was a very old practice (today it is still possible to see primitive roughly carved stelae near more elaborated "obelisks"), probably borrowed from the Kushitic kingdom of Meroe. Their function is supposed to be that of "markers" for underground burial chambers. The largest of the grave markers were for royal burial chambers and were decorated with multi-story false windows and false doors, while lesser nobility would have smaller, less decorated ones. While there are only a few large ones standing, there are hundreds of smaller ones in various "stelae fields". The last stele erected in Axum was probably the so-called King Ezana's Stele, in the 4th century A.D. The Obelisk of Axum in Rome in 2002, before its repatriation. King Ezana (c.321 – c. 360), influenced by his childhood tutor Frumentius, introduced Christianity to Axum, precluding the pagan practice of erecting burial stelae (it seems that at the feet of each obelisk, together with the grave, there was also a sacrificial altar). Over the course of time, many of these stelae fell to the ground due to: structural collapse (as, probably, in the case of the Great Stele, measuring 33 m), possibly immediately after their erection; earthquakes (Axum is in a seismic zone); or the military incursions of the Imam Ahmad Gragn during the Ethiopian-Adal War from 1529 to 1543. In the 19th century, of the three major "royal" stelae, only King Ezana's Stele remained erect, shown in the painting "Sight of Axum" of Henry Salt (1780–1827). At the end of 1935, following the Italian occupation, Italian soldiers found the Obelisk of Axum was collapsed and broken. It had fallen in the 4th century and had broken into five pieces. In 1937, it was taken as war booty and moved to Italy by the Fascist regime, which wanted to commemorate the occupation of Ethiopia and the birth of the ephemeral "new Roman Empire" (see Italian Empire). The stele was transported by truck along the tortuous route between Axum and the port of Massawa, taking five trips over a period of two months. It arrived via ship in Naples (on a ship called Adwa), on March 27, 1937. It was then transported to Rome, where it was reassembled and erected on Porta Capena square in front of the Ministry for Italian Africa (later the headquarters of the United Nations's Food and Agriculture Organization) and the Circus Maximus. It was officially unveiled on October 28, 1937 to commemorate the fifteenth anniversary of the March on Rome. The operation was coordinated by Ugo Monneret de Villard. A bronze statue of the Lion of Judah, symbol of the Ethiopian monarchy, was taken along with the obelisk and displayed in front of Termini railway station. In a 1947 UN agreement, Italy agreed to return the stele to Ethiopia, along with the other looted piece, the Lion of Judah. While the latter was returned in 1967 following the 1961 visit of emperor Haile Selassie to Italy, little action was taken to return the stele for more than 50 years, partly as a consequence of the considerable technical difficulties related to its transportation. One source also suggests that emperor Haile Sellassie, after hearing of these technical difficulties (and of the enormous costs necessary to overcome them), decided to grant the stele to the city of Rome, as a gift for the "renewed friendship" between Italy and Ethiopia. This assertion, however, remains very controversial and was not recognized by successive authorities. Colonel Mengistu Haile Mariam who overthrew the emperor in 1974, asked the Italian government to return the stele to Ethiopia. Another controversial arrangement, according to some sources, seems to be that Italy could keep the stele in exchange for the construction of a hospital in Addis Ababa (Saint Paul's Hospital) and for the cancellation of debts owed by Ethiopia. In any case, after the fall of the Mengistu regime, the new Ethiopian government asked for the return of the stele, finding a positive answer from the then president of the Italian republic Oscar Luigi Scalfaro, in April 1997. The Northern Stelae Park in Axum, with the King Ezana's Stele at the centre and the Great Stele lying broken. The first steps in dismantling the structure were taken in November 2003, under the supervision of Giorgio Croci, Professor of Structural Problems of Monuments and Historical Buildings at Sapienza University of Rome. The intent was to ship the stele back to Ethiopia in March 2004, but the repatriation project encountered a series of obstacles: The runway at Axum Airport was considered too short for a cargo plane carrying even one of the thirds into which the stele had been cut; the roads and bridges between Addis Ababa and Axum were thought to be not up to the task of road transport; and access through the nearby Eritrean port of Massawa — which was how the stele originally left Africa — was impossible due to the strained state of relations between Eritrea and Ethiopia. The runway at Axum airport was then upgraded specially to facilitate the return of the stele. The dismantled stele remained sitting in a warehouse near Rome's Leonardo Da Vinci International Airport, until 19 April 2005 when the middle piece was repatriated by use of an Antonov An-124, amidst much local celebration. It was the largest and heaviest piece of air freight ever carried. The second piece was returned on 22 April 2005, with the final piece returned on 25 April 2005. The operation cost Italy $7.7 million. The stele remained in storage while Ethiopia decided how to reconstruct it without disturbing other ancient treasures still in the area (especially King Ezana's Stele). By March 2007 the foundation had been poured for the re-erection of the stele near King Ezana's Stele, structurally consolidated in this occasion. Reassembly began in June 2008, with a team chosen by UNESCO and led by Giorgio Croci, and the monument was re-erected in its original home and unveiled on 4 September 2008. When it was reassembled in Rome in 1937 three steel bars were inserted per section. When the obelisk was hit by lightning during a violent thunderstorm over Rome on 27 May 2002 this caused "considerable" damage. In the new reconstruction the three sections are fixed together by a total of eight aramid fiber (Kevlar) bars: four between the first and second and four between the second and third sections. This arrangement guarantees structural resistance during earthquakes and avoids the use of steel, so as not to again make the stele a magnet for lightning and to avoid rust. Several other similar stelae/obelisks exist in Ethiopia and Eritrea, such as the Hawulti in Metera. Like the Obelisk of Axum, the other stelae have a rectangular base with a false door carved on one side. ^ "Italy to keep Ethiopian monument". BBC News. 2001-07-20. Retrieved 2013-07-07. ^ Poissonnier B. (2012) The giant stelae of Aksum in the light of the 1999 excavations, in Fauvelle-Aymar F.-X.(ed. ), Palethnology of Africa, P@lethnology, 4, 49-86. ^ a b c "No return for Ethiopian treasure". BBC News. 2001-06-22. Retrieved 2013-07-07. ^ Johnson, Paul (12 March 2005). "Trundling Musso's stolen obelisk back to its African home". The Spectator. ^ a b c d "Obelisk arrives back in Ethiopia". BBC News. 2005-04-19. Retrieved 2013-07-07. ^ "Ethiopia unveils ancient obelisk". BBC News. 2008-09-04. Retrieved 2013-07-07. ^ "Rome obelisk struck by lightning". BBC News. 2002-05-28. Retrieved 2013-07-07. ^ "''Corriere della sera (in Italian)'';L'obelisco conteso rinasce ad Axum". Corriere.it. Retrieved 2013-07-07. 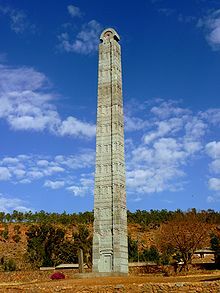 Wikimedia Commons has media related to Obelisk of Axum.